Photograph 2006 by Jacqueline Banerjee. Red Lion Square has several important associations with the Pre-Raphaelites. Morris & Co. was first established at no. 8 but is itself is no longer distinguishable among the mish-mash of old buildings and new office blocks. No. 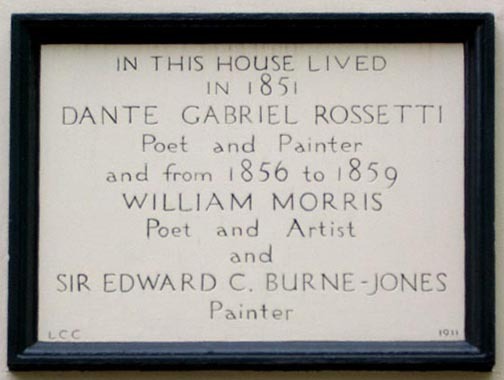 17 however has an old LCC (London County Council) plaque stating that Rossetti lived there in 1851 and that Morris and Burne-Jones lived here in 1856-59. Almost opposite would have been no. 31, now subsumed into an office block, where the Working Men's College was originally housed [JB].